Many home exterior paint schemes have three colors, or four if you include the roof. The primary one is the field color, which is the main surface color. Usually this is the color of the sides of your house, be it brick, wood, or siding. Secondly, we have the trim color, which is the is the woodwork around you house’s doors, eves, and windows. The doors and shutter colors are the final element and often these are the same color. Your roof can also be taken into consideration, as is usually already a color. Unless you are replacing it, the roof color will remain the same and can affect your choices of other exterior paint. A good place to start with is figuring out which exterior colors will complement the roof. Many older houses may have stone or brick as their field colors, so it already has been decided for you. Remember that a professional cleaning of your stone or brick siding will really show the true colors of the field color, so you can then begin to choose the other accent colors. If your house does need field painting, it is wise to consider the natural surroundings when choosing colors. This is also true of any landscaping that might be present. Think about how that landscaping looks at different times of years. For instance, if you have bright trees or flowers that bloom in the springtime, you may want an exterior field color choice that complements those. Think about where your home is situated, as well. 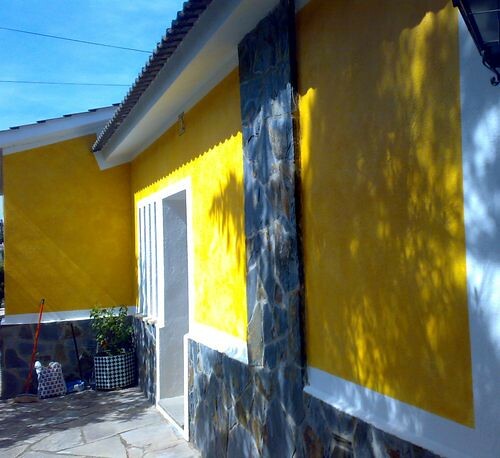 A loud, bright paint job, far out in the country, surrounded by nature may look odd, but in a sunny city the same scheme can look like it belongs. In fact, sunny climates lend themselves well to brighter colors. Mostly, vivid colors are used for the trim, shutters and doors to accent the field color, which is usually more subdued. Historic homes often require special attention to their architecture and time period paint arrangements, so spending some time researching this would be sensible. It is also a good idea to take a stroll around your neighborhood to look at other color combinations and to make sure you’re your selections are harmonious with those around you. You can even be so bold as to knock on your neighbor’s door and compliment them on their paint choices. They may be willing to share their paint color names with you. You can then put your own take on the colors and styles you find around your community. Before you start painting, go to the paint store and pick up some exterior-paint color cards that offer color combinations. This will help you to see what colors go with others. Use those swatches or cards to hold up next to your doors, trim, and existing field colors, to make sure the colors complement each other. Try those same swatches out in full sun and shade options, to mock what you house will really look like in those lights. Also, try those swatches out at different times of day, to really make sure that the colors represent themselves well. E.H. Rossman is a freelance writer based in Portland, OR. He learned about Portland house painting options from Brian Hodge Painting in Hillsboro, OR.